Distance from city center: 15 km. Which airlines fly to Paris Orly Airport? There are more airlines flying to Paris Orly Airport. See here for a complete list of airlines flying to Paris Orly Airport or look for flights to Paris. How many runways and passenger terminals does Paris Orly Airport have? Paris Orly has two terminals the South and West Terminals (Terminal Sud and Terminal Ouest). Both are roughly the same size. There is no logic behind the airline assignment so you would need to check your ticket carefully to which terminal you need to go. Here are the more popular airlines: Air France, BA, Aeroflot and EasyJet are in Terminal Sud. Transavia, Icelandic, Tui and Norwegian Air shuttle are in Terminal Ouest. Both terminals are connected by the free Orlyval automatic shuttle train. Where is Paris Orly Airport located? Orly airport is located about 15 km south of Paris city center. The free Orlyval shuttle train also connects both terminals to Antony station which is served by the RER B line which can take you to several metro stations in the center and to Charles de Gaulle Airport to the north of Paris. Tickets, including the Orlyval, costs €10.75 to central Paris. A cheaper option is by bus. OrlyBus will take you in 30 minutes and for € 8.00 to the city center. Buses depart every 10 minutes and tickets can be bought at Platform 4. Another even cheaper option is bus line 183 which departs in front of the Terminal Sud and will bring you for 2 euros and in 50 minutes to Porte de Choisy station. See for tickets and schedule: buses: ratp.fr . A taxi to a destination in central Paris would cost about 30 euro. 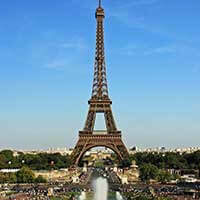 What are popular destinations from Paris Orly Airport?